Last night, the night before the Undy 5000 in Philadelphia, I watched the Stand Up To Cancer special. The last time SU2C had a television special my Joe was still here with me. He didn't watch the show (choosing instead to watch something else downstairs), but I remember it being an uplifting show, I remember making a donation in his honor, and I remember crying a lot. While a lot has changed since then, the tears were one thing that did not. I was glad to have a box of tissues within reach as I watched. However, in addition to those inevitable tears (I mean really, did you HEAR that Taylor Swift song?! ), I had some other strange bodily activity going on too. For the first time in a long time, I started to get some pre-race butterflies wrecking havoc on my tummy. I hadn't felt butterflies like that before a run since I was in high school on the girls track team. I didn't get them when I ran my first 5k in May, but something about this time was definitely different. This was the Undy 5000. I had set a goal to improve on my previous time and I had run more than 28 miles over the past month to prepare. 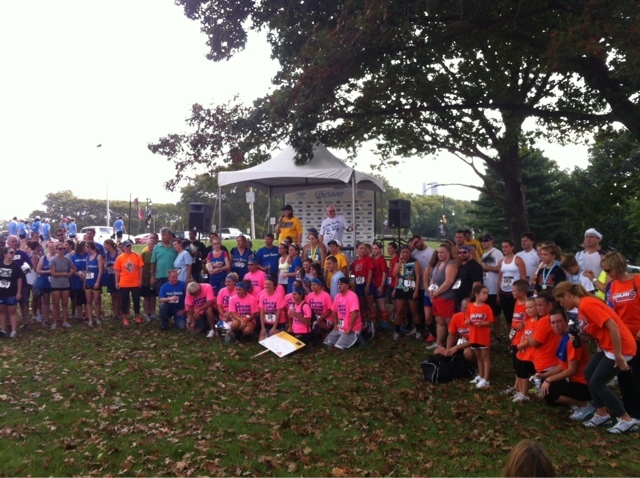 I had raised over $1,200 for the Colon Cancer Alliance in support of this run. And this run was deeply personal. After all, it was colon cancer that took my Joe, that left our Domani without a Dad, and that cut short an endless stream of hopes and dreams. 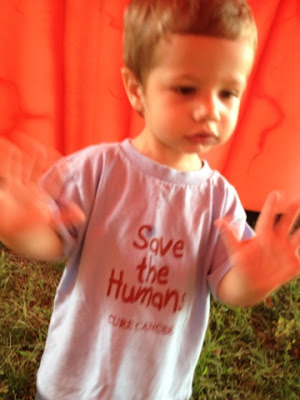 I hate colon cancer and long for the day when no family has to go through what my family did. For that reason, I knew today's race would be an emotional one for me. There were powerful survivor stories and survivors who ran faster times than I did. There was the devastating news that one of the teams (Bob's Battlers) had lost their namesake to this horrible disease just this past Monday. There was my little man who alternated between watching the Star Wars episode of Family Guy on what was his Dad's iPad and walking in and out of the giant inflatable colon, being sure to touch whatever polyps he could reach. And then there was the starting line and the Afghan Whigs tunes that came up at the beginning and end on random shuffle and the guy holding the sign that let Stacey know she is his hero. So many touching moments, but by the end of the first mile (on a 9'22" pace) I just felt gratitude for the ability to be there and run and celebrate my Joe. Beating my last 5k time by almost 5 minutes! 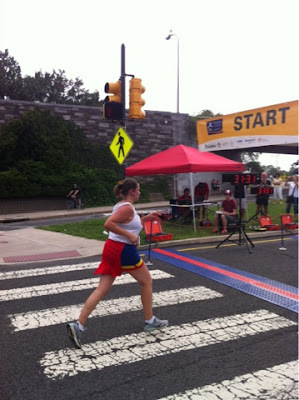 When I finally crossed the finish line and realized I had achieved my goal, I felt relief and happiness and gratitude. 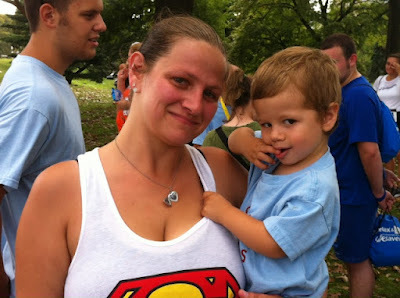 After all, I did improve my time by almost 5 minutes (and by more than 5 minutes if you count that I started way back from the start line) and I did get to hug a good friend and my little guy at the end. But, I also felt a hole as I wondered what it would have been like to finish that race and be greeted with a hug from my husband, my very own Superman. It's been 9 months, and I have realized that what I miss most is that deep bond of marriage and the sharing of life that comes with it. Domani and I have a very full life and we share it with each other, but it is still painfully obvious that there is a piece missing for both of us and I think it's moments like today when I feel it most. "No photos, please. 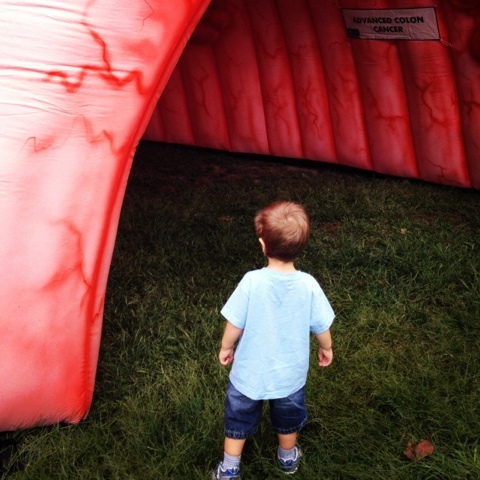 I'm busy checking out this colon." I know that Joe would have been proud of me today and happy that Domani and I are finding so many special moments to share together. I also know that he would be overjoyed to see all the people who have come around me and Domani to offer support. From my parents and sisters and other family members who have helped with babysitting while I train to Leanne who stayed with the little guy while I ran the 5k today. From the many donors who helped me exceed my fundraising goal to all my tweeps and FB friends who always seem to offer encouraging words just when I need them most. If he could, I know that Joe would thank each of you for loving us and being there at those moments when the grief becomes overwhelming. I do feel Joe's presence on days like today and especially when I am running. That in itself is special and encouraging. The one thing though that I would most want to share with him about today was the reply tweet Malinda and I got from The Afghan Whigs twitter account. All the fundraising and goal-breaking is cool, but I just know that he would have been most impressed by that. Honoring survivors and the family and friends of those affected by colon cancer. Domani and I are hiding somewhere behind the crew in orange. You can still make a donation to the Colon Cancer Alliance through my personal fundraising page if you are so inclined: http://support.ccalliance.org/site/TR/5K/UndyNEW?px=1309592&pg=personal&fr_id=1560. It was so great to see you on the road before the race and to meet your beautiful son. What an incredible honor to have met you through the Afghan Whigs and to learn more about you and your family. Thank you so very much for sharing your story, your pain and your hope.